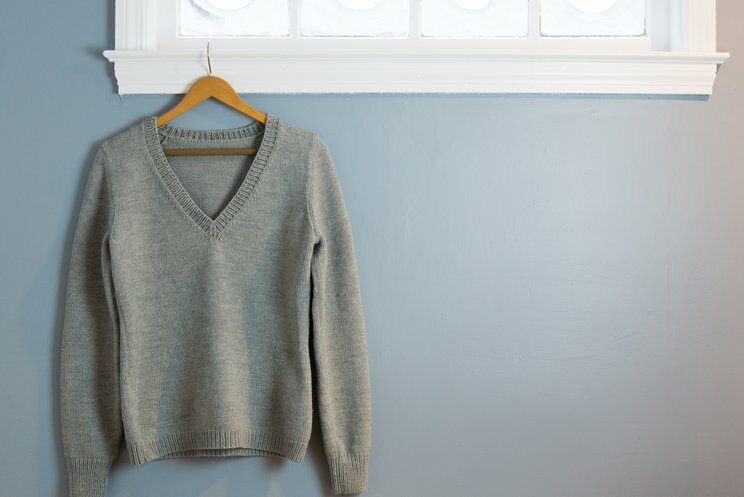 A basic V-neck sweater ranks at the top of most people's wardrobe staples. And with CustomFit, yours can suit you perfectly. 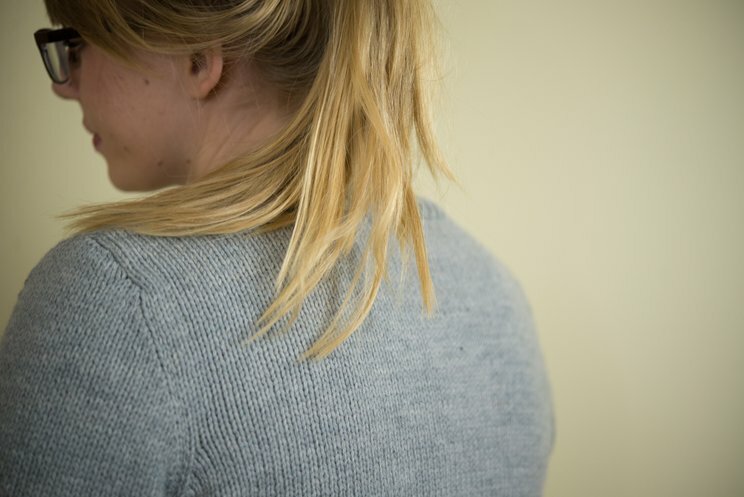 Firth has a moderately deep neckline, 1x1 ribbed edgings, and is available in your choice of sweater fits, silhouettes, sleeve lengths, and sweater lengths. 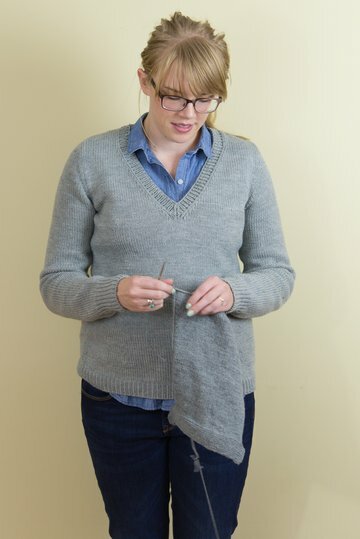 It looks great in just about any yarn, in any gauge you'd care to knit. 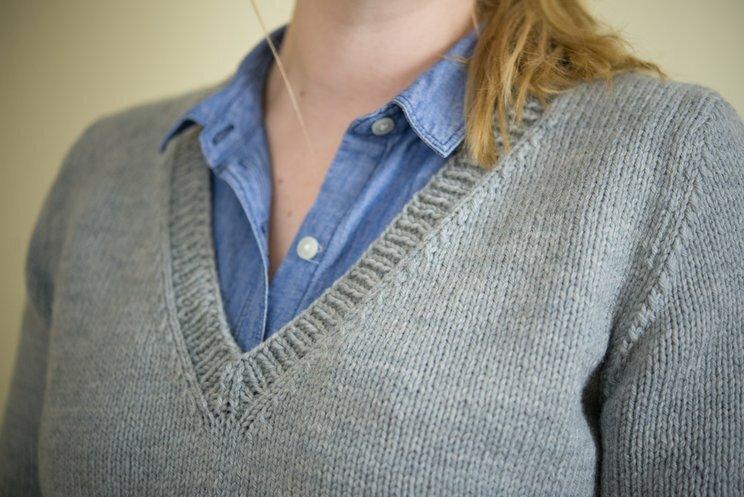 Lauren is shown in an "hourglass relaxed" fit in Quince and Co Lark's color "Iceland"; she's chosen an average sweater length and long sleeves, with an hourglass silhouette. 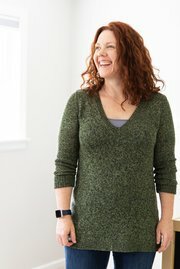 Amy is shown in a women's "average fit" in Habu Textiles N80 Wrapped Merino 4p in color Green; she's chosen a tunic sweater length, long sleeves, and an a-line silhouette. Lauren's sample was knit in Quince and Co Lark, an all-American 100% wool that's soft, sustainable, and that comes in a variety of great colors. I used the color "Iceland", at a gauge of approximately 5 stitches per inch. For a standard size 30 (32, 34, 36, 38, 40, 42, 44, 48, 52, 56, 60)'' bust at the same gauge, you'll need approximately 6 (7, 8, 8. 9, 9, 10, 10, 12, 14, 16, 18) hanks of Lark. 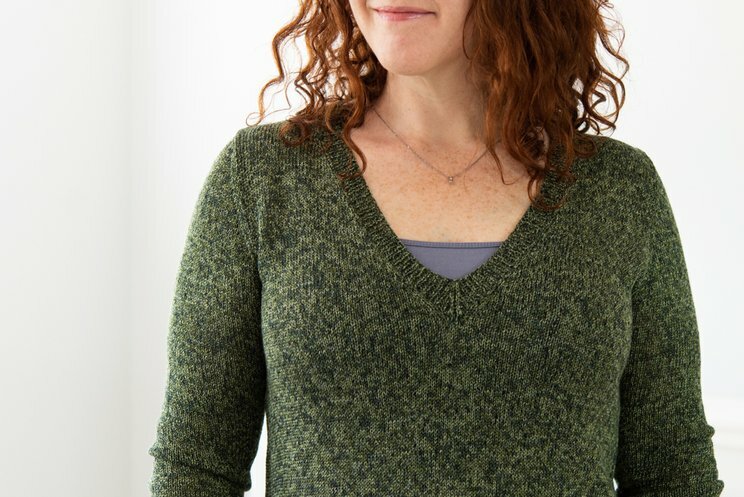 Amy's sample was knit in Habu Textiles N80 Wrapped Merino 4p in color "Green"; I liked a gauge of approximately 6.5 stitches per inch. 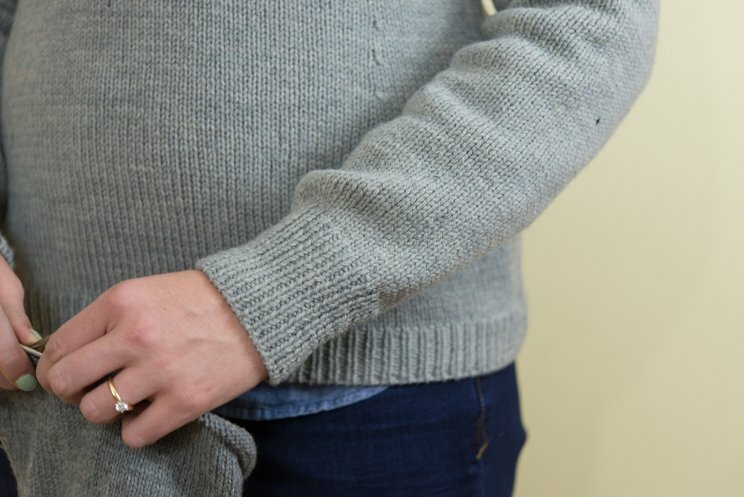 For a standard size 30 (32, 34, 36, 38, 40, 42, 44, 48, 52, 56, 60)'' bust at the same gauge (and the same length/silhouette options), you'll need approximately 7 (8, 9, 9, 10, 10, 11, 12, 13, 14, 14, 15) cones of the Habu.